Kryptonite glass and bong cleaner is a clay-based cleaner. It uses clay to absorb tars and resins working as an encapsulator. This process is similar to what happens when using kitty litter on an oil spill in your garage. Because Kryptonite is a clay-based cleaner, it doesn’t require the harsh solvents that are present in all commercially available dab rig, glass pipe and bong cleaners. Kryptonite’s formula was scientifically engineered to work on hands, clothing, tools, hard surfaces like sinks and countertops, grow trays, extraction tubes and other surfaces tainted with cannabis plant material. Kryptonite is a coating solution so you never have to vigorously shake your bong or submerge it to keep the cleaning solution in contact with the dirty areas. 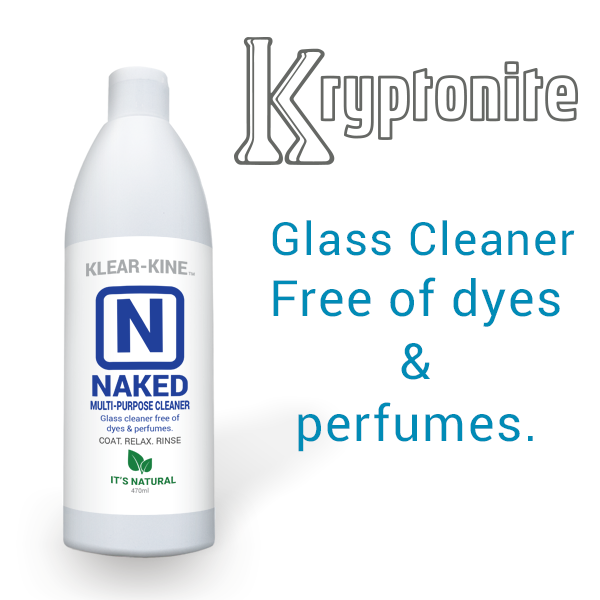 Kryptonite’s solution allows it to move between percolators, chandeliers and other places that are difficult to reach with salt, alcohol and acetone-based cleaning products. Kryptonite’s unique clay-based formula has the lowest flash point (temperature it burns) than any other commercially available cleaner. For those of you not familiar with flash point, gasoline’s flash point is 45. Alcohol’s flash point is 47. Acetone’s flash point is 15. So the next time you pick up an acetone or alcohol based cleaner, remember that these types of cleaners are extremely flammable. Kryptonite glass and bong cleaner, however, is not flammable. Hopefully you don’t plan to use your pipe after you clean with acetone or alcohol! For those of you who have a sense of the environment, pouring gasoline, alcohol, D-Limonene or acetone down the drain is considered environmentally hazardous. U.S. water treatment facilities don’t have the capability of removing these seriously harmful chemicals from our water supply. So remember, the next time you see a video showing how to clean your glass pipe or water bong using salt or alcohol, be sure to thank them for helping to poison your environment. Kryptonite is the only cleaner to pass Colorado’s Health and Safety tests. It is safe to use and will eliminate the tar, resin, and smell typically found in your glass pipes or bongs. DO NOT USE KRYPTONITE ON ACRYLICS AND OTHER SOFT PLASTICS. Simply coat the inside of your glass pipe or water bong with Krytonite. Pour any remaining product back into the bottle or into a plastic bag to clean your slides or smaller pieces. Wait 20-30 minutes while Kryptonite goes to work dissolving tough, baked-on residue. No shaking or overnight soaking required! Simply rinse the piece you are cleaning with warm water.